If you are looking to buy eucalyptus, please consider top quality California grown eucalyptus. Great pricing too. Not just fall eucalyptus. The eucalyptus is preserved with a solution of glycerin and dye to prevent color discoloration. Eucalyptus is one of the most durable products amongst dried flowers. The preservation will maintain the eucalyptus softness and look for years to come. The types of Eucalyptus we sell are; baby eucalyptus, which is the most popular type grown and sold, Eucalyptus Parvifolia, Willow and seeded eucalyptus. We can also get silver dollar eucalyptus. 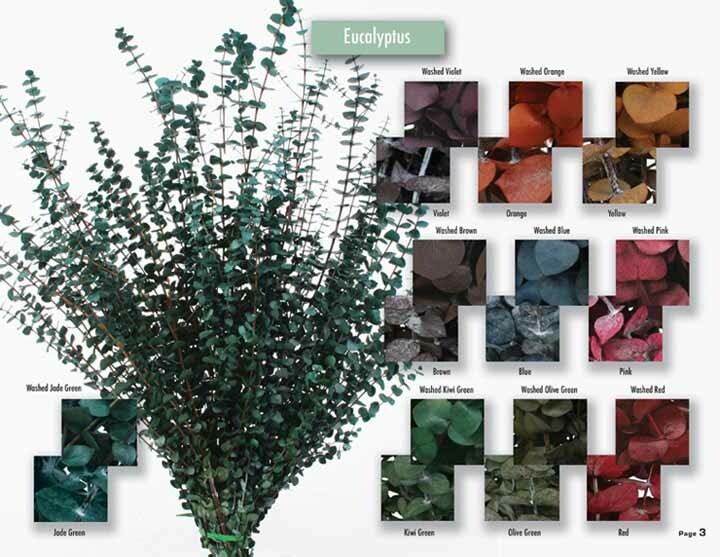 Besides the natural green eucalptus, there is an incredible variety of designer colors available. The difference beetween the "frosted" and the"washed" is the patina on the leaves. Some like it with the patina, some prefer to pay a little more for the washed type. Just contact me for further details. Preserved Eucalyptus collection from California. Trendy colors as well as traditional colors. Preserved Baby Eucalyptus These 16" diameter Eucalyptus wreaths are the best quality of preserved baby eucalyptus at truly great pricing. You can use it just in their natural form, or add flowers and ribbons. Great for resale or as a base to create your own flower wreaths. I personally purchased from this eucalyptus wholesaler for over 20 years and thanks to his buying power he is passing along the savings. Further discounts are possible with orders over $500 USA dollars. By the way, Eucalyptus has a lovely fragrance and even though will weaken with time will keep fragrant for many years. Contact me for wholesale eucalyptus purchase.